I recommend that you set up your email accounts using an email client program, such as Outlook® (a component of Microsoft Office®), Windows Mail® (free with Windows 10®) or some other email program. 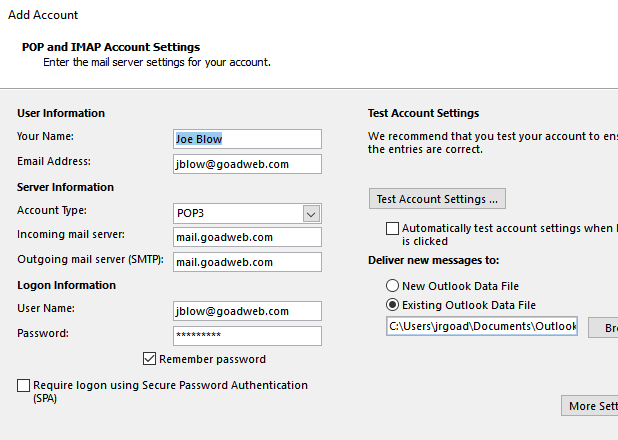 I further recommend setting up each email account using POP3 instead of IMAP. Although my mail server supports IMAP, I believe that it does not provide as much control, speed or security as POP3. Some email apps on smart phones or tablets do not seem to support a standard POP3 setup. In that event I would examine an alternative app. 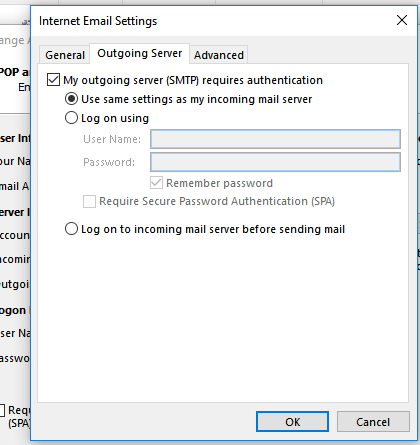 Here is how to set up your email account if you have one on my mail server. The example images indicated below are from Outlook. Since my server uses Secure Sockets Layer for security, I strongly recommend the use of encrypted connections to the mail server. Therefore use the port settings as shown below. POP3 – use port 995 with SSL/TLS. 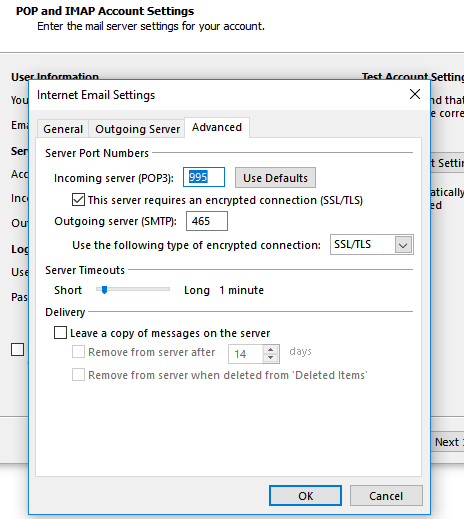 SMTP – use port 465 with SSL/TLS (or port 587 with the “Auto” setting). You must log in using your entire email address and password. You will then be presented with options as to what webmail interface you wish to use. I personally use the HordeMail choice, but you may prefer another. Be sure to log out when you are finished. Please keep in mind that all your email counts against your mailbox size quota… even the contents of your trash folder. If you delete a message when using webmail, it goes into your trash folder. You should then go to your trash folder to completely remove it from the server.